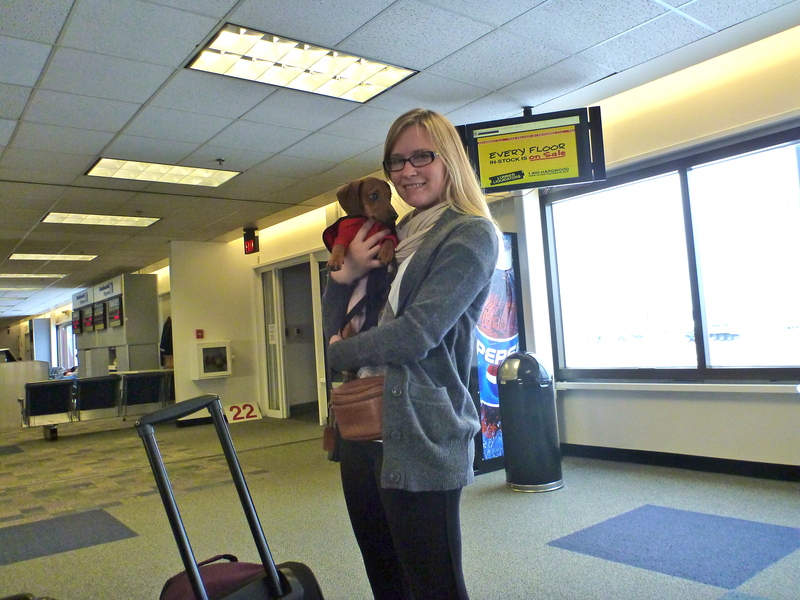 On December 30th, 2011, my grandparents drove me and mom to the Syracuse airport. Mom had 180 lbs of luggage, including lots of food, toys, and goodies for me! Luckily, mom’s doctor had written her a note certifying that I am an emotional support animal, because let’s face it, my mom is a little crazy! Because I’m considered a service animal, I was able to ride in the cabin with my mom all the way to Nairobi, thanks Delta and KLM!! The first leg of our trip was easy, we got to sit in the first row and I chewed my bone on mom’s lap all the way from Syracuse to Detroit. We had a few hours to kill once we landed in Detroit, while we waited for dad to arrive from St. Louis. I was on my best behavior, I peed in the handicapped bathroom and did my best loose-leash walking. I was SUPER excited when my dad arrived! My first transatlantic flight was from Detroit to Amsterdam. I had no idea I would be on an airplane for so long! My mom gave me some medicine so that I could sleep and boy did it make me feel silly. 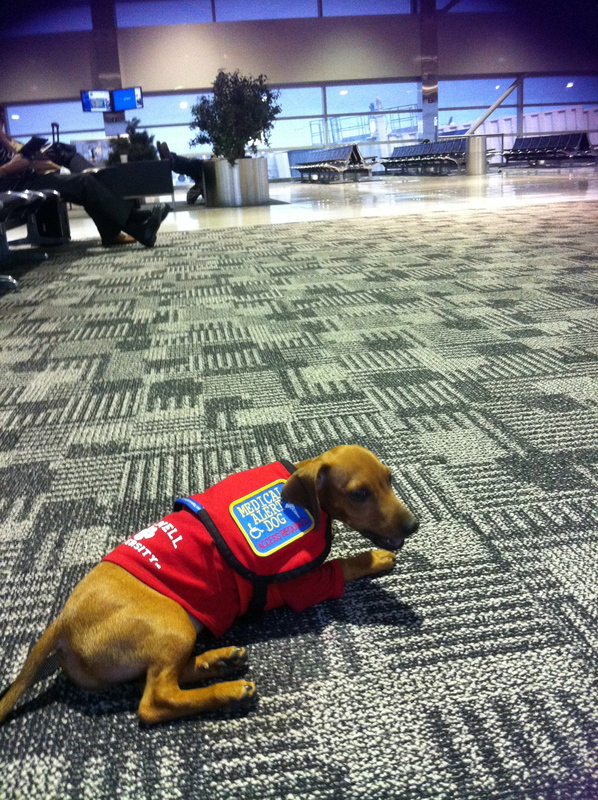 I slept for most of the flight and all the flight attendants came to see what a good puppy I was. In my opinion, I was much better behaved than all those babies and toddlers! My first international destination was Amsterdam, although I never got to leave the airport. KLM was nice enough to give us Economy Extra, so mom, dad, and I all got our own seats! At first, the flight attendants didn’t think I was allowed to go to Kenya, but mom promptly showed them my import permit and health documents and everything was fine. I got another sleeping pill for the 8 hour flight from Amsterdam to Nairobi. I don’t like to drink water from a bowl in moving vehicles, so I ended up getting really dehydrated. My body temperature went up and mom got super worried about me. Luckily dad came up with a solution. They fed me water from a syringe and I bounced back as soon as I got rehydrated. When we landed in Nairobi, mom was worried that the customs officials might give us problems, but they only glanced at my paperwork and sent us on our way. We were officially in Africa! As soon as I got outside and found some grass, I had a much-needed potty break and then we were on our way to the Hilton Hotel. The weather was awesome and I couldn’t be happier spending New Year’s Eve anywhere else.